If you are a developer, or someone cool with codes, then roll the dice. 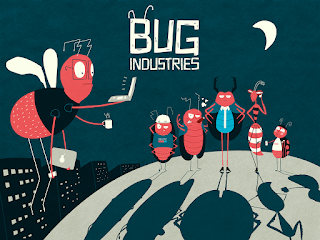 Bug Industries is a game of cards and dice with each player given an IT project assignment, in which a bunch of nasty bugs are hidden. Now, 64 of these monster bugs must be eliminated for the project to run smoothly, and the first bug-free player wins the game. You're not a developer, but part of the IT Nerd? Don’t worry, Bug Industries has got enough bugs and fun for you as well. You’ll receive 32 bug cards, 32 code cards, two dice, four game boards, and four game chips, all nicely packaged. And since it’s an offline game, it is guaranteed to be 100% bug-free. It's so simple to play that with only four bugs left, you've won the game. You roll two dice: a numbered dice called “bug dice” and an “action dice.” But the action dice shows that you have to draw a bug card - that's the godfather of Bug Industries, the stag beetle. While, the action dice gives you different options: pause, roll the dice again, draw a bugs card or draw a code card. On the game board – the headquarters of Bug Industries – you move your game chip up or down – depending on whether you can deduct or receive more bugs. It was created by a small web company that fights against bugs in software on a daily basis. The idea came up when everything went wrong and literally endless bugs were crawling out of every corner of the software project. Wouldn't it be awesome to face these bugs in real-life and kick their asses? Bug Industries is exclusively available now on Kickstarter. Bug Industries - A Card/Dice Game for IT Nerds now on Kickstarter!